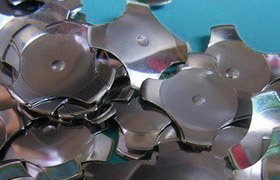 Metal Dome in Bulk is one of most popular, and the old ways, but still was the default packing method, becuase it is most simple and cheap. Metal dome packed in environmental PE bag, and the amount packaged per bag upons on metal dome size and order quantity, various from 1,000 pcs to 20,000 pcs. For example, for our 6F series (Four-leg, Diameter 6mm) metal dome, MPQ (Min Package Quantity ) is 10,000 pcs, for 8.4F, it's 5,000 pcs, and 16F and 20F, it's 1,000 pcs. 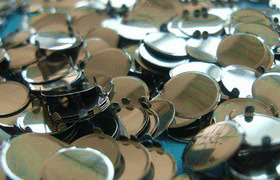 For 4mm or 5mm Circle, it's 20,000 pcs. Please consult with us for MPQ for different domes. We will put a desiccant in each PE bag, and then sealed it. So if you open the PE bag by scrissor, please remember keep that desiccant in the bag if there're still some metal domes in it. You need to put each metal dome on membrane switch, PCB or FPC by handle, speed is slower. But most of customers has machine which can put bulk domes into tube, or tape & reel so that they can be used in auto-place machine. 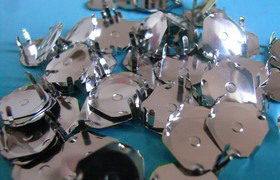 It also workabe if the labor cost is not so expensive, because this metal dome in this packing is most cheap. Contact us today if you need more information about metal dome packing, or has special requirements for packing of metal domes.